Limit switch is a screw mounted on a UHMWPE angle so that it's isolated from the frame. 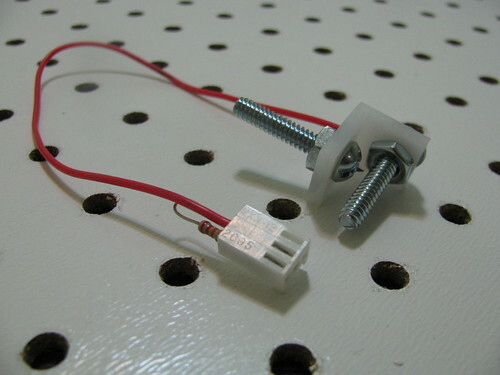 The limit switch wire is connectedto the screw. On the board side, a 22kOhm pullup resistor is soldered between +5V (VCC) pin and the limit switch pin. This keeps the limit switch pin at 1 when the switch is open. When sliding element comes into contact with the screw, it grounds the pin to 0. Check the wiring scheme for more details. The MIN/MAX switch connector on RepRap stepper driver board (v1.x) has 3 pins - GND, limit switch, VCC (+5V). Solder limit switch wire to the middle pin. Solder the resistor between VCC and middle pins on the connector. Check the schematics and/or board layout to be sure which pin is GND and which is VCC. It's a good idea to use different wire color for MIN and MAX switch (e.g. green, red). Use 5/8"x3/4" UHMWPE angles left over from making sliding elements. If there are none left over, follow the step 1 in the Sliding Elements section to make some. Drill 3/16" hole in 5/8" side (trigger screw) and 1/4" hole in 3/4" side (mounting screw).